When working in a facility there are potential dangers around every corner. One of the hazards that can be the most serious is that of falling down. In addition to just slipping and falling, most facilities have many places where people can fall down stairs, off ledges, or even into dangerous products. This is why OSHA has dedicated an entire safety section to this specific risk. The section, titled “Guarding floor and wall openings and holes” is filed under standard number 1910.23. This section covers a wide range of different hazards related to falling and getting hurt. Whenever working on improving facility safety, you will want to make sure this section is clearly understood. Stairway Floor Openings – When there is a stairway in your facility, it presents a serious risk. People can slip on the stairs and fall down, or not even see that they are there if the employee is carrying something bulky. Ladder Openings – There are many cases where the only way on or off of a platform is by climbing up or down a ladder. This ladder will lead to a hole in the floor that you can climb up or down. While convenient, these openings are also serous hazards for everyone working in the area. Ledges – Facilities often need to have ledges that lead to an open area for shipping or manufacturing certain items. Whether the ledge is large or small, it can be a major hazard for anyone who isn’t paying close enough attention. Manholes – Whether located outside of a facility leading to the sewer system, or inside the facility providing access to pipes or electrical work, manhole openings can be found almost anywhere. While safe with the cover on, they can be an unexpected hazard when the cover is off. Short Wall Edges – There are many places in facilities that have short walls along the edge of an area. This is common with elevated runways that provide access to pipes and other things in the facility. These short walls do provide some protection, but people can still fall over them if not careful. Window Openings – Windows are a great addition to many facilities, but unless the glass is thick enough, they can also present a significant fall hazard. If someone bumps into the window while working, they may go right through. Of course, there are many other potential fall hazards in most facilities. In addition to reading through the Guarding Floor and Wall Openings and Holes – 1910.23 section of the OSHA standards, you should also walk through your own facility to identify any area that you feel may present a fall risk to people in the area. Once you have identified all the different areas that present a risk of falling, you will want to take steps to help minimize the potential that someone could fall. There are many different ways which you can help minimize this type of risk. The following are some of the most effective ways to physically stop people from accidentally fall in your facility. Railings – Adding railings along the edge of an area where someone can fall is one of the easiest ways to provide protection. Railings around manholes or ladder openings, for example, will protect people whether they are coming up or going down. Removable Railings – In some places, such as near a ledge, permanent railings are not a good option. You can, however, install removable railings that will provide protection most of the time, but can be removed when access to that area is needed. Toe Boards – Adding a tow board along the floor can be a great way to alert people to the danger before they fall. In addition, tow boards can stop carts and other wheeled items from going over a ledge or somewhere where the operator could fall. Floor Markings – One of the most effective options for preventing falls is adding floor markings in the area around the danger. There are a number of different options when it comes to floor markings, some of which are discussed in the next section. 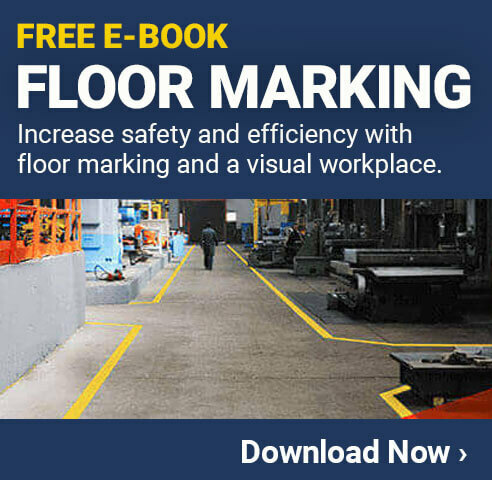 Whether used in place of a physical barrier, or along with one, using floor markings is a great way to alert people to danger before it is too late. Things like floor signs or floor tape can give a visual reminder that there is a risk of falling in the area, so people can pay close attention to their surroundings. Choosing a specific color of floor marking tape, for example, can be a great option for most facilities. This way, when they see that color they will automatically know that there is a risk of falling close by. Placing this type of marking near any ledges, holes or other fall risks is an excellent way to improve the overall safety in your facility. This should be part of your hazard communication program, since it is effectively communicating the risk people will have when working in a specific area. Whenever possible, use floor markings along with things like railings or other barriers. This will provide the highest level of protection to people who work in the area, or even those who are just traveling through. Whenever working on reducing the risk of falls in your facility, you will not only be helping to improve the overall safety of the facility, but you’ll also be helping to remain compliant with the requirements from OSHA. Simple things like adding railings or applying safety tape can help you to avoid accidents and citations from safety organizations. This is well worth the investment in time and effort for your facility.